Hemel Hempstead Town host Wealdstone tonight in a rescheduled Vanarama Conference South fixture - with admission prices having been reduced by the club. The original match took place a fortnight ago but was abandoned at half-time, with the Tudors boasting a 3-0 lead. The referee had deemed the pitch playable upon his arrival, however he later expressed his concerns about some frozen sections of the surface and at half-time he made the decision to abandon the game. The Tudors have since won 2-1 at home to Gosport Borough and drew 2-2 at Farnborough on Saturday. Wealdstone’s impressive run of form came to an end recently at the hands of Weston Super Mare; however they bounced back at the weekend by winning 2-1 at Staines. 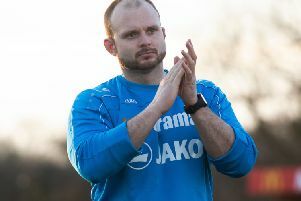 Hemel manager Dean Brennan was critical of his side’s performance after their draw with struggling Farnborough, and he will be expecting much more from his young charges tonight. “We have all been spoiled at Hemel Hempstead Town Football Club over the past three seasons,” Brennan said. “We know we need to keep our feet firmly on the floor and just take it one game a time, and that starts with Tuesday night at home to Wealdstone. “We all know what a great non-league club Wealdstone is and they have a very experienced manager in Gordon Bartlett. Kick-off is 7.45pm, and the reduced admission prices will be: Adults - £6; Concessions £4; U18s - free. Free entry for U18s is courtesy of Hemel Hempstead Town FC shirt sponsor, Underwoods Solicitors.